Aeromao's new Aeromapper Talon Amphibious drone can be controlled over a range of 30 km and can do belly landings on water. Launched by hand from the shore or a boat, the fully-waterproof Talon Amphibious is able to remain airborne for up to two hours on one charge of its battery pack, flying either autonomously or by remote control. With its far distance controlling-range, it can automatically return to its launch point if it loses radio contact. As it flies, it uses a downward-facing camera to capture 20-megapixel stills or 4K/30fps video of the sea/lake/coastline below. Real-time video is transmitted to the user over a distance of 15 to 20 km, or up to 40 km if an optional parabolic antenna is used. Buyers may also opt for a forward-facing camera that can be remotely panned, and that can lock on items of interest. 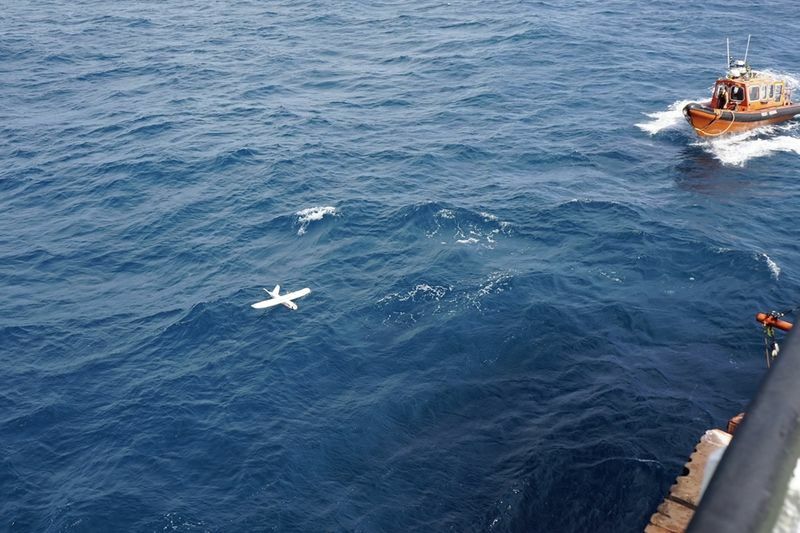 Once the drone has completed its aerial observation task, it can autonomously perform a belly landing on the water and, according to the company, it is the only product that is able to do so. Parachute landings on dry land are also possible. The drone itself has a 2-metre wingspan, weighs 3.6 kg, has a maximum speed of over 85 km/h and is made from carbon fibre-reinforced EPO (expanded polyolefin) foam. It can be seen in action, in the video below.